Pyhä-Häkki has quite a prosaic history. In the 1700s the general parcelling out of land was carried out in Finland, and then simply nobody wanted the crown forest of Pyhä-Häkki. The forest on the drier areas was dense, but as there were no waterways, it was not possible to transport and sell the logs. The mires were too wet for farming, so the whole area was left as surplus land owned by the state. In 1912, a smaller area of the Pyhä-Häkki Crown Park was protected from "all land and forest use". It was proposed in 1938 that a national park would be established in the area, but because of the wartimes, this plan was not carried out until 1956. 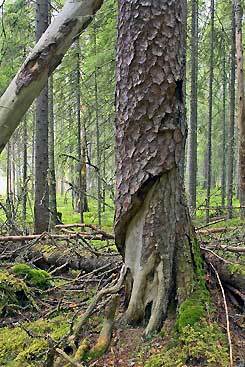 For centuries there had been a footpath through the Pyhä-Häkki area, by which an ancient pine tree was visited by people already in the old times. When the trails of the National Park were being planned, Yellowstone National Park was chosen as an example to be followed. The experience that had been got in Yellowstone was put into practice in Pyhä-Häkki as far as possible, even though in a lot smaller scale. Two nature trails were opened up in the park by man power. One covers the most important natural features and landscapes of the park, the other one goes into the old-growth forest. The ancient pine, born in 1518, died 2004 in August and soon it is coming a dead standing tree. It has lived through the times of three different states, first under the Swedish, then the Russian and now the Finnish. Pyhä-Häkki National Park, which is located at Saarijärvi, was established in 1956 along with six other National Parks. As the lands were already owned by the state the transition to a National Park was as quiet and serene as the nature of the old-growth forest that dominates the area. The area was already protected and no forestry was practised there. The National Park's area was expanded in 1982 and it now covers 1,300 hectares. Even forest ranger Juhani Saarinen, who worked in and for the National Park from 1980 until his retirement, is amazed at how the park has been spared of troubles. "At least I have yet to hear of any conflicts or problems, but then again the land had already belonged to the state and the forests were protected from forestry from 1912 onward so there was plenty of time for adjustment." Locals have always thought of the National Park in a positive matter-of-fact way. Saarinen mentions that especially young people have recognised the National Park's importance. Forest fires and storms of past times have moulded the structure of forests in Pyhä-Häkki, but there have been no large natural upheavals since the National Park was established. Saarinen recounts the story of an especially unforgettable episode, which reflects the park's tranquil way of life. A few years ago there were Great Grey Owls (Strix nebulosa) nesting in the National Park. "One of the two nests was so close to a marked hiking trail that you could see it without leaving the trail. We were quite nervous around the time the chicks were supposed to leave the nest wondering how they would fare and if hikers would demand to be compensated for damages if the chicks swooped down and accidentally scraped hikers' heads. The chicks however left the nest without incident and without anyone noticing", Saarinen remembers. Around 9,000 people visit Pyhä-Häkki National Park annually. Saarinen believes that especially during winter the park would be able to accommodate more visitors. Those not interested in skiing off-trails can choose between two maintained ski trails, which pass by a cooking shelter. Settlers moved to the Pyhä-Häkki area over a hundred years before the National Park was established. Poika-aho Crown Tenant Farm was established in 1854. It is mentioned for the first time in the Saarijärvi church register in 1860. In 1869 the farm was ordered to pay a temporary tax in the form of 137.4 litres of grain. The first farmer to enter into a contract between the crown tenant farm and Metsähallitus in 1889 was August Viktor Häkkinen. To retain the right to own the farm August had to keep the buildings and fields in good condition and clear 12.091 sq. metres of field and 9.6728 sq. metres of mire fields. The stone fences which are still standing today were built when the fields were cleared. In 1855 and 1858 there were vast forest fires, which affected the area's landscape. The contract emphasized that it was the farmer's responsibility to keep a watch on the area and make sure that fires did not spread. The crown tenant farm's situation was reviewed in a survey every five years. It was first surveyed in 1895, and it was found that the main house and barn were brand new and in good condition. The sauna and drying barn, however, were in such poor condition that the farmer was ordered to build new ones immediately. August Häkkinen owned a horse, 3 cows and 3 sheep. Use of wood was recorded meticulously. The fire wood used at the farm had to be from dry pine trees, gathered from the ground or the top braches of trees. It was estimated that the farm used 50 cubic metres of wood annually. The survey was carried out by forest ranger Arthur Böök, who reminded Häkkinen that slash-and-burn agriculture was strictly forbidden. In 1904 August Häkkinen's widow sold the farm's right of possession to Otto Hänninen. The sale was not actually legal, but such transactions were common at the time. Poika-aho Crown Tenant Farm was sold for 1,200 Finn Marks. The farm became independent of Metsähallitus in 1933. Later the farm house served as a herders', loggers' and hunters' cabin at which point a hole was made in the wall to pass food through from the kitchen to the men staying there. The farm was owned later by the Blom family and then sold to Metsähallitus in 1977. The main house was remodelled in 1999 - 2000 into a rental hut. At this point a fireplace was added and the floors, ceilings, doors and windows were redone. These days the hut is rented to hikers.